Warner Bros. is threatening to digitally change the facial tattoo worn by Ed Helms in The Hangover Part II on the DVD release to avoid having to pay artist Victor Whitmill, who claims the tattoo is a copy of his original design. 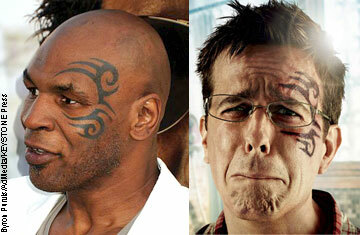 Whitmill designed a facial tattoo worn by Mike Tyson face, and in the sequel Helms wakes up with a similar tattoo. A court memorandum obtained by E! News reads: “If the parties are unable to resolve their dispute, Warner Bros. does not intend to make any use of the allegedly infringing tattoo after the film ends its run in the theaters because Warner Bros. will digitally alter the film to substitute a different tattoo on Ed Helms’ face.” Whitmill originally asked that the film’s release to theaters be delayed until the court case is settled. His request was denied. The document also states: “If this dispute is not resolved within the next two to three weeks, Warner Bros. will have to spend the funds that would otherwise be available for settlement to digitally alter the film to substitute a different tattoo on Ed Helms’s face.” Whitmill is now asking that an injunction be put on the film starting August 8, 2011. Warner Bros. is requesting more time — saying that they’ll have their case ready by February 2012. For Pete’s sake! At the end of the day, who cares? What makes this tattoo so special? The person wearing it! If it was on any other schmuck, no one would care. Victor, find another hobby! I don’t understand how someone can claim rights over a tattoo design, especially when it’s on the face. This whole thing is stupid. Really tho, check Tyson’s face, was there a little ‘TM’ by the tatoo? Then how was anyone to know! I have claimed writes to this post. I demand it gets altered if anybody copies it. LOL WHAT A JOKE! I think you mean rights…. Any way to make a quick buck will be contemplated, I see the studio’s point in trying to avoid paying this Dbad moeny he doesn’t deserve because the stupid justice system would be dumb enough to award him compensation, not to mention cost of lawyers. It’s easier and costs less to alter it digitally. Sorry, I can’t spell today. In his biggest comedy concert-movie yet, What Now? Kevin Hart performs in front of a packed Philadelphia football stadium, giving audiences major laughs. ed helms mike tyson The Hangover Part II Victor Whitmill Warner Bros.